Do You Know The Most Dangerous Roads To Bicycle In Western Mass? It’s Spring in New England which means people are digging bicycles out of storage and hitting the roads. Where I live, on Route 47 in Sunderland, MA, cyclists often jam pack the road — it’s a very scenic ride, if not always a safe one because of the narrow road at times. But Route 47 doesn’t make the list of most dangerous roads to ride in Western Mass because I’ve never had a problem (I did almost hit a horse while I was riding on Rt. 47). How about a few Massachusetts bike safety stats? These come from the Fatality Analysis Reporting System, which is a great database of all kinds of traffic statistics going back to 1994 and sortable by state. In 2008 there were 10 bicyclist fatalities in Massachusetts, which put the state below the national average (MA 1.54 per million population; national 2.35). An interesting thing to note, despite the small numbers: in Mass. there were more bicycle fatalities at intersections (6) than non-intersections. That isn’t true for the U.S. as a whole, where 65 percent of fatalities take place at non-intersections. This is the general area where Meg Sanders was hit on Sept. 22, 2005, by an armored truck coming down Elm St. (Rt. 9) in front of Smith College. It’s a dangerous spot for a number of reasons: traffic picking up speed coming down the hills, tough left turns for cars, a lot of traffic, and on Elm St. where Meg was hit, there isn’t a lot of room for cyclist to squeeze through the parked cars and traffic. Keep your head on a swivel if you’re riding through there! Doesn’t seem that dangerous? Well remember, two thirds of all bicycle accidents happen at non-intersections. This area is fairly straight and mostly flat; just the kind of place motorists can lose concentration. Add on the fact that the two lane road is pretty narrow, and you’ve got a recipe for getting run off Route 5. Many factors here for disaster. I got this area from a tip, noting the mass of pot holes and wind. I was on this road a couple of times last season and can testify to the potholes. 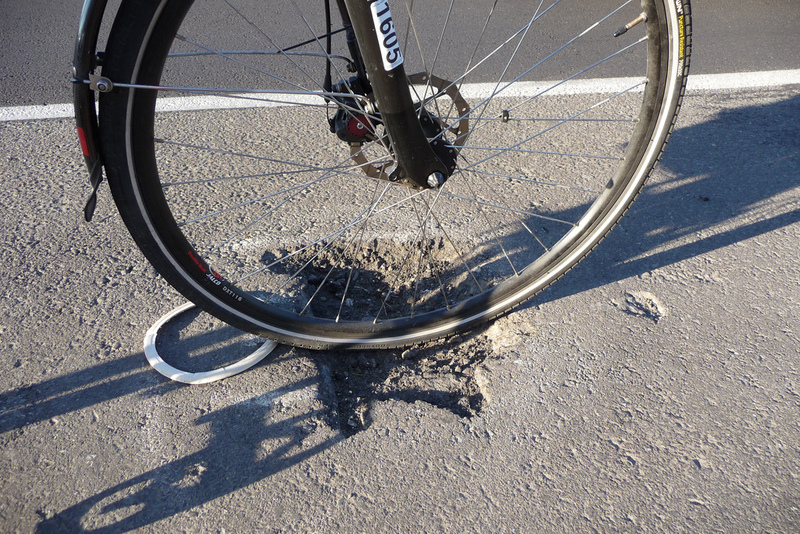 If you’re bicycling in New England, you have to expect the potholes. Last year I blew-out 2 tires and had to straightened my rear rim 3 times due to running over potholes. I guess I need to practice pothole swerving. Did I miss some dangerous places for cycling in Western Mass.? Leave a comment below and I’ll update the list. I would like to thank some people for their contribution to this list: Marie Lisewski, Allan Douglas, and David Kutcher. Photos by dbking and KTesh and republished here under a Creative Commons license. Hendrick Street, Easthampton. Beautiful road (I know, I live on it!) but treacherous for bikers and walkers on the side that goes towards Rt 141. Winding, no clearance, no breakdown lane, no shoulder at all where there is incline (downward off side of road) so no place to move to if a car that can’t see you at all approaches the curves. Doesn’t matter if you’re facing or not facing traffic. Misty wasn’t on the bike path.